The Germanic Visigoths were the Western Goths, separated from their Ostrogothic brethren by the divisions caused in the 270s. The kingdom was based north of the Danube, in the region of modern Bulgaria and Romania. The Balti Goths (or Balthes, Baltungs, or Balthings) took their name from the Gothic word for bold. They were considered second in status only to the Amali Goths, but the latter were leading the Ostrogoths so the Balti were able to assume leadership in the west, apart from one brief attempt by the Amali to regain control. The Tervingi Goths, led by the Balti Goths, consolidate their realm between the Dniester and the Danube in modern western Ukraine, and become known to the Romans as the Visigoths. They are led by Ilderic, son of one of the last universal Goth kings, Ovida. His brothers, Respa and Veduc, command the Ostrogoths. Son of Ovida of the Goths. First ruler of the Visigoths? Brother and co-ruler, or possibly king of the Ostrogoths. Son of Ilderic. Claimed as king of Ostrogoths & Visigoths. The names of kings of the Ostrogoths and Visigoths contains at least two crossovers during the late third and early fourth centuries, suggesting perhaps that the divisions are not quite so divided after all until the coming of the Huns. It is possible, given the approximate dates for Geberic, that he rules both groups until the rise of Ermanaric re-establishes the division between Visigoth and Ostrogoth. Apparently now concentrating on the western Gothic territories (appropriately, if the supposition is correct that he has lost control of the Ostrogoths to the east), Geberic conquers Dacia, ejecting the Vandali. There appears to be a gap in the line of Visigothic kings which can only be explained by Eormanric of the Ostrogoths extending his rule westwards to encompass the Visigoths. Given the apparent closeness of both branches of the Goth people over the past century or so, it would be entirely natural for all Goths to accept the most powerful king. It is possible that Athanaric remains a sub-king or co-ruler until the destruction of the Ostrogothic kingdom in 376. The Visigoths are defeated by the Huns in 376, and flee across the Danube to seek shelter in the Roman empire. Badly treated and starved of supplies, they revolt and ravage the land south of the Danube, killing Emperor Valens in battle. Peace is made and they are allowed to settle in northern Greece, in Thrace and Moesia, charged with defending the Danube. Rival of Athanaric. Converted to Arianism. Balti Goth. Died following a brief illness. Alaric retreats into Epirus with his Visigoths and the Western Roman military commander Stilicho is forbidden by the Eastern Roman government from pursuing him. Granted the rank of magister militum per Illyricum by the Eastern Romans in about 399 in order to protect the area from takeover by the Western Romans, Alaric leads his people through the Alps and winters in northern Italy in 401. Stilicho collects all his available forces, including units from Britain, to defeat Alaric in 402, although not decisively. Alaric leads his forces into northern Italy, undefeated by the Romans. 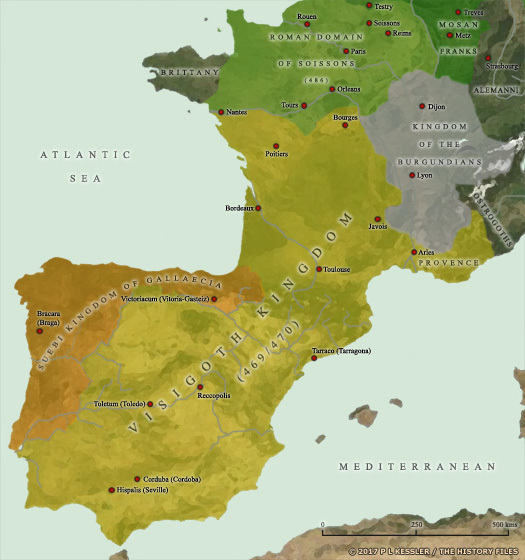 The following year Athaulf brings another Visigothic army to reinforce Alaric. Communications (and intrigues) between Rome and the Visigoths break down, so Alaric leads the Visigoths to the sack of Rome. Shortly afterwards, he himself dies. Brother-in-law. m Emperor Honorius half-sister, Placidia. Athaulf's accession improves relations with Rome to an extent, and the Visigoths are instrumental in defeating the usurper, Jovinus, on the Rhine. 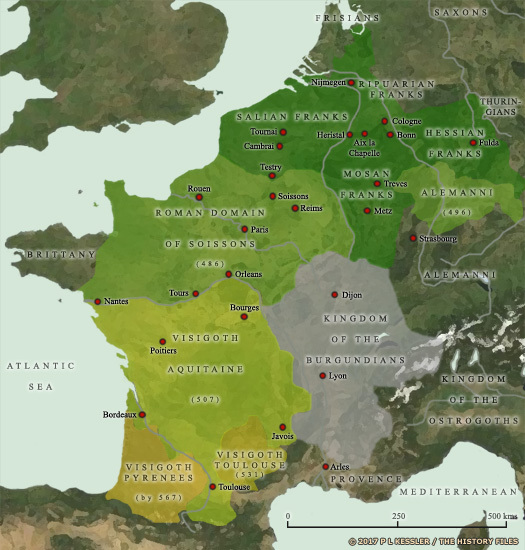 The Visigoths subsequently move south, into Aquitaine in southern Gaul, accompanied by an important group of Alani. The Visigoths come into renewed conflict with Emperor Honorius which culminates in the siege of Vasatis (modern Bazas) in 414. Paulinus of Pella, a Christian poet who is one of those being besieged inside the city, records the fact in his work Eucharisticos (Thanksgiving) that the Visigoths are supported by a group of Alani. Having previously established a level of friendship with the unnamed king of these Alani, Paulinus persuades him to side with the city's Roman defenders. The Alani leader does so, turning over his wife and son to the Romans as hostages. The Visigoths withdraw from Vasatis and retreat into Spain while the Alani are settled as Roman allies. Amali Goth. Assassinated by the Balti Goths. Balti Goth. Helped establish the Visigoths in Aquitaine. The Siling Vandali are dissipated by warfare against the Visigoths, who are acting as Roman allies. However, they still maintain their hold on the former Roman provinces of Lusitania and Baetica (the latter of which includes the city of Gades). The Alani are also defeated alongside their comrades-in-arms. One of Wallia's grandsons is Ricimer, who is the power behind the throne of the Western Roman empire during its last days. Allowed by the emperor to settle in southern Gaul in a treaty signed in 418, Theodoric founds the kingdom of the Visigoths. The Visigothic kingdom of Tolosa (Toulouse) was created, with the consent of Rome, in the province of Gallia Aquitania, a large and rich region stretching from the Lower Loire to the Garonne in south-western Gaul. The Roman domain of Soissons was located to the immediate north. The Visigoths straight away forced out the Alani and Vandali, and these groups then headed southwards into Hispania. As part of their settlement agreement with Rome, the Visigoths were obliged to provide military support, but essentially they ran an independent kingdom within the fragmenting Western Empire. Odds and ends from other tribes also joined them, such as members of the Scirii. Son of Alaric. Died at the Battle of Chalons. The Visigoths kill the king of the Alani. Under pressure from the Visigoths, and from Roman attacks, the Vandali to the south see an opportunity presented by the unsettled conditions in Africa. They and the Alani migrate to the south of Iberia from where they invade Roman North Africa. Once there, they carve out a kingdom over the course of a decade, taking the cities of Carthage and Utica, and leaving eastern, central and southern Iberia back in Roman hands. The Roman magister militum, Aëtius, sends his subordinate, Vitus, to Iberia to put a halt to Suevi raids. He leads a combined Romano-Visigothic force into the province of Carthaginiensis and Baetica, but when his unruly force meets the Suevi in battle, it is routed. The defeat confirms Suevian control of Lusitania and Baetica and the loss of the bulk of Hispanic revenues to Rome. Theodoric is forced to change his foreign policy when relations improve between Rome and Genseric of the Vandali. This weakens Theodoric's own position as Rome's favourite barbarian ally, so he invites Rechiar of the Suevi to his capital at Tolosa (Tolouse), and in February 449 the two put aside the differences between their peoples. To seal the new peace, Theodoric gives one of his daughters in marriage to Rechiar. To preserve their new domains, the Visigoths fight on the side of Rome to halt the advance of the Huns at the Battle of the Catalaunian Plains (otherwise known as the Battle of Chalons), in north-eastern Gaul. Their cousins, the Ostrogoths (literally, in the case of Thorismund whose cousin is Valamir, king of the Ostrogoths) are forced to fight on the side of the Huns. Theodoric, hoping to kill Attila, is struck by a spear and falls from his horse, to be trampled by his own cavalry, but the Huns are fought to a standstill and are forced to withdraw. Son. Cousin of Valamir of the Ostrogoths. Theodoric encourages magister militum Avitus to become Western Roman emperor, which he does. His reign is brief before he abdicates, but it renews the empire's good relations with the Visigoths. The Franks and Syagrius of Soissons unite to defeat the Visigoths. After years of equivocal behaviour from the Visigoths, Euric follows a decisively anti-Roman policy. Last Visigoth king of Toulouse. Syagrius, Roman dux of Soissons, seeks refuge with Alaric after the Franks conquer the former Roman territory. Syagrius is betrayed and handed over to the Franks. Defeated by Clovis, king of the Franks, the Visigoths are pushed south into Spain where they rebuild the kingdom. They may still retain portions of Aquitaine, as the region's overlordship is very uncertain in this period. It seems likely that it is Frankish vassals who are contesting with the Visigoths to secure the region. Alaric's elder son, Gesalec is tentatively accepted as king, but is unable to hold Narbonne against the Burgundians. The Ostrogoths intervene at Narbonne, driving out both Visigoths and Burgundians. This forces the Franks and Burgundians to withdraw from the Mediterranean coast. 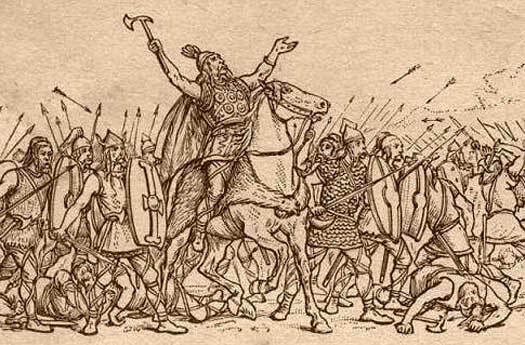 The following year the Ostrogoths defeat Gesalec in battle and he flees. One further attempt is made by him to recapture Narbonne, after a year spent in Aquitaine to gather his forces. He loses a second battle and is soon captured by the Ostrogoths. The Ostrogoth king, Theodoric, assumes the Visigothic crown until his death in 526, nominally acting as regent for the infant Amalaric who is able to take his rightful place as king after Theodoric's death. Rome is finally retaken by Byzantium, which governs Italy from Ravenna. This marks the end of Ostrogothic rule in Italy. The Ostrogoths themselves eventually merge into the general Italian population, becoming indivisible from them, or migrate north of the Alps where they also merge into the general population. However, the Tauric Ostrogoths still retain an independent identity. By this point, it seems that Aquitaine is more firmly under Frankish control. A duke is assigned by Chlothar I to govern the region. King Miro of the Suevi oversees the Second Council of Braga, in which the new dioceses that had been sought by King Theodemar are confirmed to exist, although the dates for their founding are unknown. In the same year, following up on a Visigoth attack in 570 and perhaps prompted further by this loss of influence over areas of the Suevi kingdom, Leuvigild attacks. He invades the valley of the Duoro, pushing back the Suevi to the west and north by 574. Son. Exiled, and executed in 586. Falling out with his father the previous year, Hermenegild now revolts against him. The quarrel is based on Hermenegild's recent conversion to Catholicism and his refusal to revert to Arianism, thanks to his marriage to Ingunthis, the Catholic daughter of Sigisbert I of Austrasia. He is blockaded by his father and the Suebian King Miro fights to break that blockade, but is defeated. Crucially, Miro is forced to recognise Leuvigild as a friend and protector to him and his successors, giving the Visigoths leverage over the whole Suevi kingdom. Hermenegild reaches an agreement with his father, ending the revolt, but a further falling out results in the prince being executed by his father just two years later. The Suevi, on the north-western coast of Iberia, are finally absorbed into the Visigoth kingdom. About this year, the Visigoths and their Romano-Hispanic subjects are led by Recared to abandon Arian Christianity in favour of the Roman Church. Ceuta, and the Pillars of Hercules, which until very recently had fallen under the control of the Byzantine empire via Carthage, are apparently turned over to the Islamic empire by 'Count Julian', as the empire prepares its invasion of Visigothic Spain. The kingdom is overrun by the Moorish Islamic invasion of the Umayyads, at the battles of Jerez de la Frontera and Ecija. Cordova is captured (711), as is Seville and Toledo (712). The Battle of Segoyuela sees Saragossa captured (713), and Valencia falls (714). In opposition to the occupation of Iberia, the small Asturian kingdom is founded in the unconquered and mountainous north-west soon afterwards (718), while various march counties emerge over the course of the next century, including that of Urgel (close to Andorra) of which the first count is a Visigothic noble by the name of Borrell. Interestingly in Africa, a Nubian splinter state called Alodia is founded at some point around the start of the seventh century. The name could be Visigothic or Vandali, deriving from the Germanic elements ala, meaning 'other' or 'foreign', and od, meaning 'riches' or 'wealth'. Could the creation of the state be influenced by refugees or captives from either state? The Umayyad prince, AburRahman, escaping the massacre of his dynasty in Arabia, establishes himself and his line in Spain. Eventually, in response to the declaration of the Fatimid Shiite caliphate, the Spanish Umayyads proclaim their own emirate of Spain.